We are committed to giving you the best cayman dive experience with the best equipment and most highly trained crew. Welcome – Our concept is simple, We take small groups, on the best dive boats with the friendliest crew. We are divers and built the company using over 20 years of passion and experience in the dive industry. 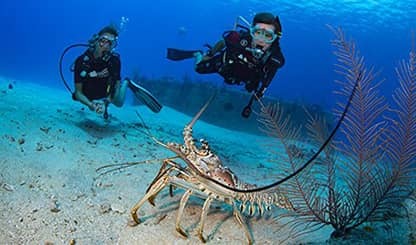 We showcase the very best of Grand Cayman Diving. 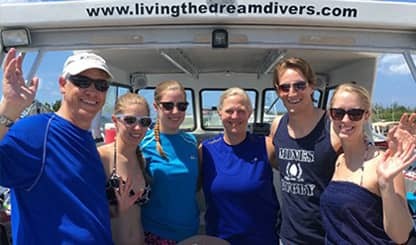 Whether this is your first dive or you have thousands, contact Liz and let her plan the perfect Cayman Dive vacation to suit your wants and experience levels. We have custom built the best dive boats in the industry. Every detail has been thought out to create the ultimate Cayman Dive experience. 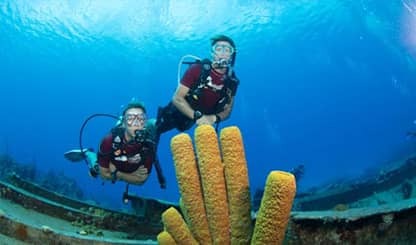 The best way to experience Cayman Diving is to do multiple days of diving. Check our dive packages that offer great pricing if you are looking to multiple days of diving with us. Diving is safe, fun and easy. Open up a whole new world and learn to dive. Let one of our passionate, experienced instructors get you certified. Or continue your education with an Advanced course. In order to provide 5 star Cayman Dive service, we specialize in small groups on the biggest and newest dive boats in The Cayman Islands. We believe the best dive trip is one with the smallest groups on board the biggest, nicest boats with the highest level of service and value. We believe in providing outstanding customer service from beginning to end- after all, it is your vacation and we are here to make it hassle-free. We love to teach Grand Cayman Scuba Diving. Liz and I are very proud to have built an instruction team that is passionate about their craft. This year three of our instructors, Matt Clarke, Sydney Darrow and Nate Lancaster were awarded the coveted PADI Elite Instructor Rating. Completing your Enriched Air Certification is a must for every diver. Its super easy and quick to complete online. Once on island we walk you through the practical side and you are Nitrox certified. We are continuing our popular special offer of just $140 USD per diver.